This page of my website has to do with the Phantom Train (Le Train Fantôme), also known as the Nazi Ghost Train. If you scroll down you will find my brief description of what happened, originally written in 2003 and appearing elsewhere in this website. For a short bibliography on the subject, click here. First: A list of Allied airmen who were imprisoned in one of the boxcars. Second: A minute-by-minute account of the Phantom Train written by Walter Vertstraeten of what happened. Third: An account of what happened written by Jean-Marie Moortgat, alias “Brochet,” a Belgian policeman who was a member of the Resistance group MNB. Moortgat had been the cell mate of Robert Sauveur, a member of the Luc-Marc intelligence line who, before his arrest, was hidden by Arthur Schrynemakers. Fourth: A translation of the chapter on the Phantom Train by C. Lokker from the book, Des Bâtons dans les Roues, Brussels, 1985. This is followed by an article about the Phantom Train by Anne Brusselmans, who was active in aiding Allied airmen. Fifth: An English language translation of the portion of Robert Beckers’ memoirs dealing with his imprisonment, torture, and experience on the Nazi Ghost Train (Phantom Train). To read the translation and see a photo of Beckers on the day of his liberation, click on Souvenirs, Robert Beckers’ Account of the Nazi Ghost Train with photo. For the French original, which includes his experiences prior to his arrest, click on Memoirs of Robert Beckers – souvenirs résistant – including Ghost Train with photo. Sixth: A list of prisoners. It consists of approximately 977 names compiled from two separate lists provided by two different archives. Seventh: Photos of the train. The first two photos of the type of locomotive used were provided to me by the archive of the Belgian railway, SNCB. The others were taken by me of the original locomotive and one of the original boxcars at the Museumbewaartplats Leuven (Museum Repository, Leuven). Eighth: Photos of the antogonists–the engineer and fireman who foiled the plans of the SS general. On August 25, 1944, Gen. von Choltitz, the German commander in Paris, signed the act of surrender. Paris was liberated. The British Army now turned north—Brussels and Antwerp were next. 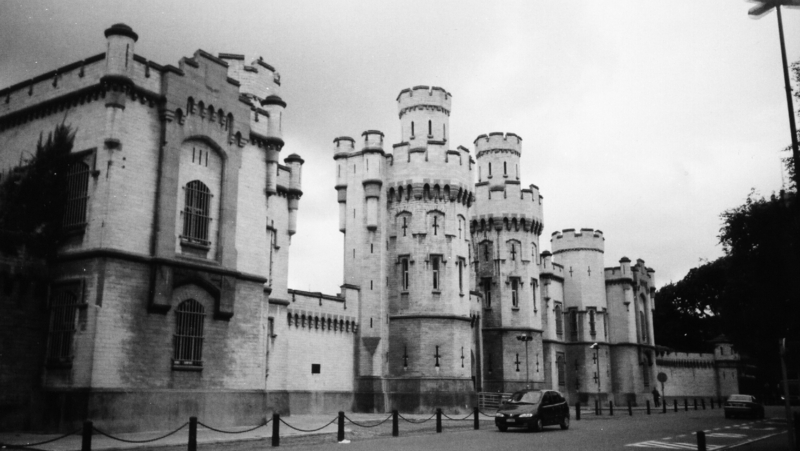 St. Gilles, the main prison in Brussels, held 1500 political prisoners, including many members of Service EVA, such as Blanche Page, and some 50 Allied fliers. By September 1 the prisoners in their cells were already celebrating their imminent release. Family and friends packed the balconies and roofs of the buildings surrounding the prison, waiting to see their loved ones. But shortly before midnight, the German commander of Belgium, SS Gen. Richard Jungclaus, ordered the 1500 prisoners to be shipped to Germany. When the prisoners were ordered out of their cells to be loaded onto trucks, they fought back but fists were no match for rifle butts and bayonets. As the convoy of trucks made its way to the Gare du Midi railway station, the desperate prisoners wrote messages on scraps of paper and torn remnants of clothing pleading for help, which they threw from the trucks to the onlookers on the streets. On Sep. 3 the “Phantom Train” returned to Brussels where International Red Cross workers freed the prisoners. Fifteen hundred people had been saved. The British Army liberated Brussels on Sep. 4. 1. A speech by René Ponty, President of the Amicale des Prisonniers Politique Rescapes cu Covoi du 3 September 1944: http://sites.google.com/site/adandoy/mnb/letrainfantome. 2. The PBS documentary, “Last Best Hope, A True Story of Escape, Evasion, and Remembrance,” at http://www.pbs.org/lastbesthope/. 4. For a list of books and one TV documentary on the Phantom Train, click here. 5. A five-minute excerpt of The History Channel’s documentary on the Phantom Train (referred to as the Nazi Ghost Train) appears at http://vimeo.com/7698202. My father LACROIX Robert was in this train. he was graduated chemical engineer in june 1943 and avoid forced labour at the IG-Farben plant of Leverkussen so has to join a dropped SOE party and “résistance” grp “NOLA”.He is 88 years old. He was shot and captured as in a ground party for a “carpet bagger ” air dropping in August 1944 at Ittre (belgium) near by Nivelles . Questionned at the Gestapo at Nivelles (by belgians) but also at the Sipo-SD buildings at Brussels (347 and 510 av. Louise) then at the St-Gilles prison. (no major complains about the german behaviour. I am currently in touch with veterans of the 106th USID ; among the associates I found Christian de Marcken ; his father (US citizen) and his familly lived in Belgium , I think he “saved” some crewmen but was betrayed by a neighbour and sentenced to death by (the) Germans and Marcken, Ch.was also freed from this train. My aunt , named somewhere in this epic, was a younger sister of my mum Josephine Ochelen ,(Hanosset ) from Ans , (Liege )where I was born in 1931.Her name was Emilia Hanosset , she was a nun, her religious name was :Sister Agnes , at the time of her arrest , she lived at the convent in Mont-Saint -Jean , of the Sisters of Charity of St Vincent de Paul., and she willingly returned to that convent after her liberation from that Nazi Ghost Train. I saw her a few times after that , but left Belgium to go to work for the UMHK in the Katanga Province of the then Belgian Congo , from 1956 to 1960, and saw her once in 1961 before leaving Belgium to migrate to Australia where I still reside since , and I took the Australian Nationality.I saw her in 1976 , then in 1979 when I returned to Belgium on holidays to visit my family , as well as my wife’s family, and she died later on, and was interred with military honours. Her younger brother , my uncle Jean-Marie, also joined the armed resistance in the Belgian “Secret Army “in the Ardennes “Maquis “and is still alive at this date.